Thomas Pogge, Australian Nat'l Univ / Yale Univ. In current debates about the world economy, “growth is good” often appears as a truism. Growth leads to wealth, it is said, and greater wealth is surely desirable, especially for the poorer developing countries. Closer inspection, however, leads to a far more nuanced assessment. Legend has it that there was a time when economists celebrated economic growth, regardless of its distribution. Such economists would have judged alternative economic practices and policies exclusively by their relative impact on the inflation-adjusted (per capita) social product. I am not sure such economists were ever dominant. Economists have long seen the point of income and wealth in the satisfaction of human preferences and understood that, insofar as such satisfaction increases with rising income or wealth, it does so at a declining rate. 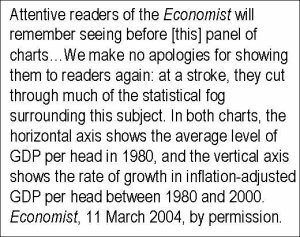 At any rate, the legend of the growth-only economists is useful because it allows real economists to stress that they are different, that they favor pro-poor growth, growth-with-equity, or some such thing. This is crucial to their theological role of appeasing the conscience of their wealthy constituents and of reconciling rich and poor alike to the great globalization push of the last twenty-five years. If economic experts committed to equity and eradication of poverty celebrate this push and the growth it produces, how can we withhold our approval? Consider this example from the Economist (March 11, 2004). 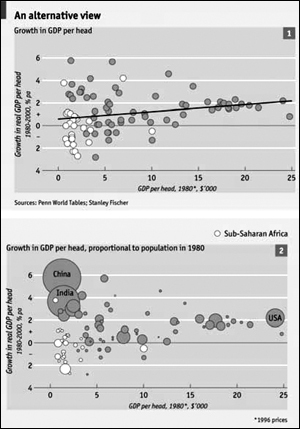 The message the Economist conveys with these two charts is that critics of recent globalization are mendacious or confused when they complain of inequitable growth: Only when the population size of countries is ignored (as in the top chart) can it appear as though global economic growth is benefiting the rich disproportionately. As soon as population size is taken into account (as in the bottom chart) it becomes clear that the poor are benefiting mightily—the rise of China and India is living proof of this. A further message here conveyed is that globalization’s supporters, such as the Economist, care about poverty and inequity and would not be such ardent supporters if the poor were not benefiting along with the rich. Who Benefits from Recent Growth? Growth can benefit rich and poor alike, and thereby reduce poverty. But to what extent has World Trade Organization (WTO) globalization actually done so? The Economist is right to suggest that the top chart cannot answer the question. And it rightly prefers the bottom chart: The added information about population size matters in that, other things being equal, it is better for faster growth to occur in more populous poor countries than in less populous ones. Nonetheless, the bottom chart cannot settle the matter either. One reason is that it reports growth in gross domestic product (GDP) rather than growth in gross national product or income (GNP/GNI). Both concepts allocate each unit of income uniquely to one country. But they do so differently: When residents of country A derive income from country B—for instance, returns on investments or revenues from the sale of natural resources they own in B—then such income is counted toward the GDP of B yet toward the GNI of A. When our concern is with poverty of and equity among countries, we should assess national growth trajectories in terms of GNI, which excludes the earnings accruing to foreigners and includes earnings that residents derive from abroad. If the oil price rises and a U.S. company, owned by and paying dividends to U.S. investors, therefore earns more from the oil it extracts in Nigeria, then this extra gain should count as enriching the U.S. rather than Nigeria. From devdata.worldbank.org/dataonline (accessed June 15, 2007). This database does not provide inflation-adjusted GNI data. Nonetheless, the ratios of these nominal $-figures (in the right-hand column) are comparable across years. 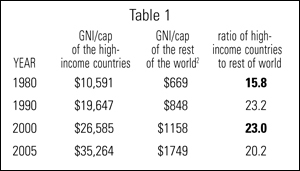 Footnote in Table 1: Calculated by dividing the two residuals: (world GNI minus high-income country GNI) divided by (world population minus high-income country population). Data from devdata.worldbank.org/dataonline (accessed June 15, 2007). Derived from Table 1 in the World Bank’s World Development Reports for the years 1982, 2002, and 2007, respectively, and market exchange rates in the relevant years. Again, the ratios among these nominal $ figures are comparable across years. Clearly, then, in terms of the more appropriate GNI per capita measure, the developing countries, and the poorest of them especially, have not participated proportionately in global economic growth during the globalization period. In fact, the distance between the richest and the poorest countries has more than doubled, to a staggering 122:1 ratio. Branko Milanovic, Worlds Apart: Measuring International and Global Inequality (Princeton University Press, 2005). —international inequality or inequality among country averages—while ignoring the far more important dimensions of intranational and global inequality among persons. See, for example, Kevin Danaher, ed., 50 Years Is Enough: The Case Against the World Bank and the International Monetary Fund (South End Press, 1994); Thomas Pogge, World Poverty and Human Rights (Polity Press, 2002); Peter Singer, One World (Yale University Press, 2002); Joseph Stiglitz, Globalization and Its Discontents (Norton, 2002); and George Monbiot, Manifesto for a New World Order (New Press, 2004). By endorsing the bottom diagram, it sets aside what is morally most important: poverty and equity among human persons.